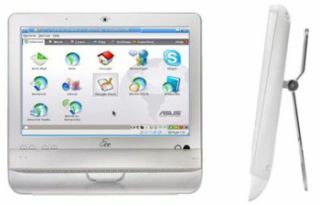 The touchscreen Eee PC rumours kicked off earlier this year way back in March, with Asus finally releasing information on the machine this month and Play.com in the UK already taking pre-orders. A penny shy of £400 will get you Asus' cutting edge Eee 'Top' touchscreen-based desktop when it launches, later this year. The Eee Top is by far the most advanced digital Etch-a-Sketch yet developed by humankind! We expect to hear more on confirmed launch date for the UK from Asus later this very week. Play.com claims that the specs on this white beauty include a 1.6GHz Intel Atom CPU, 1GB of RAM, a 160GB hard drive, 15.6-inch LCD, Windows XP Home, a 1.3-megapixel camera, built-in stereo speakers, WiFi and a bunch of ports and integrated graphics set. It pencils the release in for November 20 (tbc, as noted above) at a price of £399.99 (again, to be officially confirmed later this week). TechRadar will, of course, have a full review of the Asus Eee Top as soon as we get one in for thorough testing.